Bangladesh Betar job written exam routine 2018. Bangladesh Television Job Circular 2018. BTV Job Circular 2018. 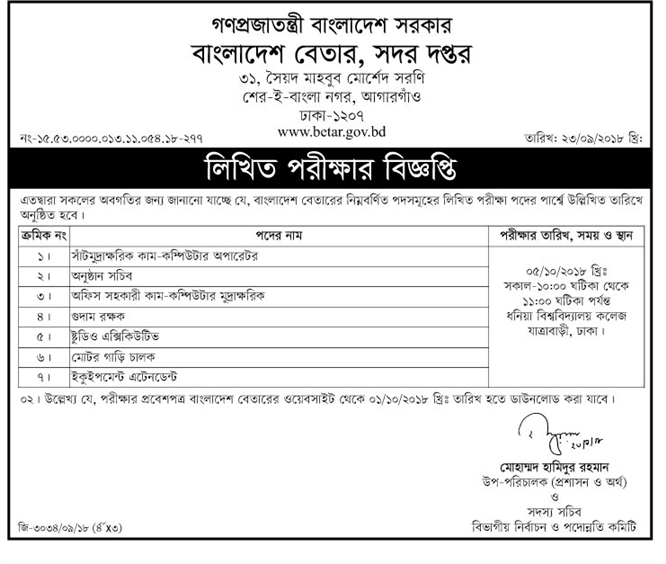 Bangladesh Computer Council Job Circular 2018. BCC Job circular. BCC exam date. Bangladesh Betar Job Circular 2017. Betar Bangladesh Job Application last date September 8, 2018. Bangladesh Betar Result. 3rd and 4th Class job. Applicants will get all information from www.betar.gov.bd web site. Applicants age maximum 30 years as on 8th September 2018. DOICT job exam admit card will send by email. To get admit card by mail, applicants have to provide additional envelop & stamp. Application fee Tk. 100/= which have to pay by treasury chalan from Bangladesh Bank. Details post mention in job circular. More than 115 post available for recruitment. Primary selected applicants have to carry all documents during viva exam which they have mention in application form. Only written exam pass applicants will get interview card. Written exam result will publish ministry web site. Driver, Typist candidates must face practical exam.